Just because you prefer your burgers FOA (Free Of Animal) does NOT mean that you should miss out on the experience that is clutching a coupla juicy buns in your hot little hands. This list is not just for the vegans and vegetarians of the world, it’s for anyone who likes burgers. If you HATE burgers and HATE delicious food, then turn away now! Do not pass go and whatever you do—do NOT collect $200. 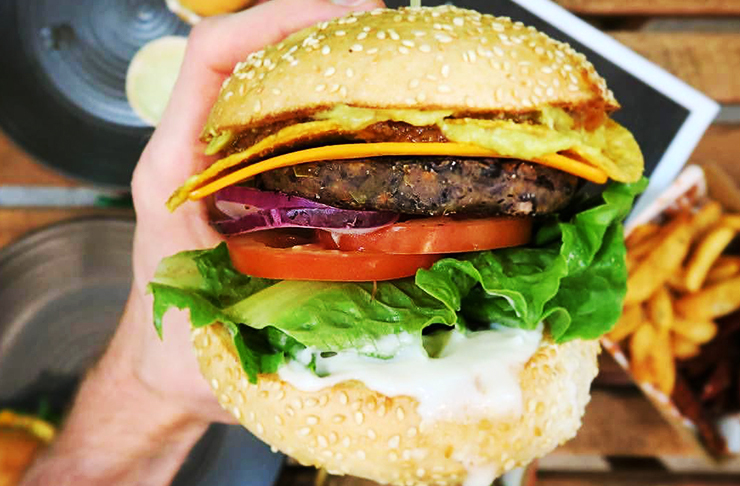 But if you LOVE food and burgers and live animals, then bookmark this baby and work your way through the best vegan and vegetarian burgers on the Sunshine Coast. We have one word for you: halloumi. Need we say more? Probably not, but we will anyway! CK Coffee Bar & Wholefoods did something so right when they decided to make the star of this burger halloumi. Halloumi, or Or Queen H as we like to call her around the office (only her friends can call her that though), is like the Beyoncé of the cheese world. We’re positive there are other ingredients on this burger and they’re all fantastic back-up dancers to Queen H, but when you’re a star—well, you’re a star. Elixiba or the ‘Vegan Taj Mahal’ as it’s more commonly referred to in the vegan community (not confirmed, but sounds plausible) dishes up some of the best vegan food on the Sunshine Coast. The menu is basically free of everything, which sounds bizarre and unappetising but somehow they make incredible food appear out of basically no ingredients. We’re only embellishing a tiny bit, but no kidding, this place is the absolute bomb! And their burgers are to die for, especially the new kid on the block, the hemp burger. Appropriately named, Moo-Free Burgers is, in fact, very much free of moo. It’s also free of baa-baa, oink and chicken noises. Which is excellent news if you’re a vegan! A whole burger joint, just for you guys! What a time to be alive! But honestly, even if you usually prefer your burgers to have moo-like qualities you need to try this place . One bite of anything off the menu and next thing you know you’re standing on a street corner yelling ‘murderers!’ and passing out pamphlets. Okay, okay, okay we know! It’s technically not a burger, but because we’re not a stickler for the rules (unlike you are, gawshhh) we had to sneak this guy in sporting sunglasses and a moustache. The Ah-Maizing Courgette sandwich from Made is worthy of scraping in undercover. Trust us! The sweet corn and zucchini rosti combined with pumpkin dahl and lemon mayo is all that is good in the world. Oh Betty, you didn’t think we forgot about you, did you? Sweet, sweet Betty. The belle of the ball and the apple of our eye. Betty can do no wrong. Betty is perfect. And Betty would never let us down if we asked for a vegetarian burger. Betty created a burger that could only exist in the dreams of the most avid mushroom lover. So many shrooms, so little time. The day we can legally marry a burger joint will be the day we get down on one knee for Betty. Another V-dawg heaven! (V-dawg is slang for Vegan because Vegan’s are gangsta AF). If you love pulled pork but don’t like pork, you’re in luck! The slow-cooked pulled jackfruit burger is the most delicious pig-free, pulled pork burger we’ve ever tried. The smoky sauce and creamy slaw is a combination that not even RSVP.com could’ve united better than C.N has. Well played Cafe Nurcha, well played. We haven’t used the words macadamia and lentil yet together because Who even does that!? But Raw Energy just laughs at us humbly because they’ve been pairing those two beauties for years. Raw Energy does a few vegan/vegetarian burgers but honestly we are a bit biased towards this one. It’s as easy as picking a favourite child. Because any burger that has a macadamia and lentil patty in it, is a winner in our eyes. And deserves 100% of our money and possessions when we die. If your wildest dreams made a baby with some heavily clogged arteries it would be Good Bar. This place is so outrageously delicious and dishes up some of the best burgers on the Sunshine Coast. But the burger that will get your vegan waters churning is The Hipster! Complete with a perfectly manicured beard, corduroy overalls and a pet bonsai called Simone, this burger is not only delicious but it will tell you that it’s vegan about 100 times before you finish your meal. Because it’s not a burger article without adding our mate Hello Harry. And does he disappoint on the vegetarian front? Absolutely does not! He gives us a Middle Eastern Chickpea burger! And it’s damn delicious! And it makes you say things like ‘Ugh, yes, ugh, my gawd, chew, chew, chew, drool, drool, ugh *pass out* drool *pass out again* drool’. Want more than just a burger? Check out the Coast's first vegetarian brunch bar, Two Point Oh, here! Are you a vegan? Have you seen our list of the best vegan cafes on the Sunshine Coast? What about the best vegetarian cafes on the Sunshine Coast?